​April photo in public domain which these channles call Undated & Unverified. Seriously ?? 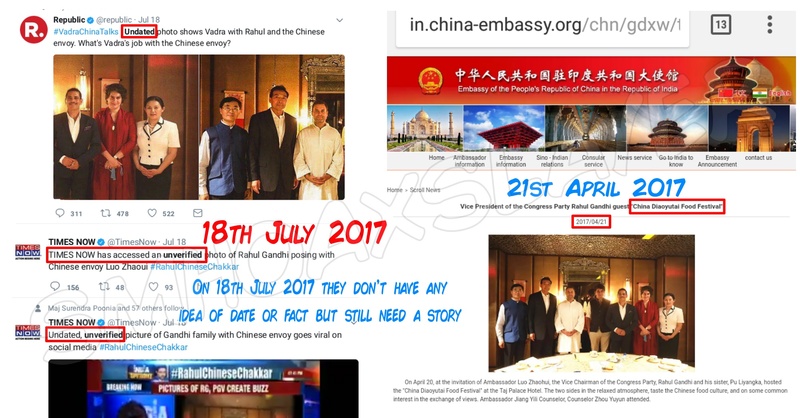 Timesnow and Republic posts an ‘unverified’, ‘undated’ photo of Rahul Gandhi standing with Robert Vadera, Priyanka Gandhi with people from Chinese embassy. The photo was from a chinese food festival hold in April 2017 in Delhi attened by ministers from other parties as well. Are these channels worth what they stand for ? April photo in public domain which these channles call Undated & Unverified. 1. They can not not find a photo on Google – Not capable, not worth, so can they be believed ? 2. This was an intentional mistake. – you know it ! Someone asked about this photo yesterday on Twitter and a proper proof and details were provided but didn’t have any idea these channels used this photo for prime time debates calling them Unverified and undated. Dear Times Now & Republic, when you don’t have any idea about it, why use it in the first place at all ? This may easily be called as Black Day, next stop after Nano GPS Chip in Indian Journalism. But didn’t have any idea about prime debate on these two channels which I came to know from AltNews Post. ← A Photoshopped image of an empty chair is viral. Stop wearing plain white clothes, one may photoshop your picture for some agenda ! LOL !!! April 17, 2018 Hoax Slayer Comments Off on Stop wearing plain white clothes, one may photoshop your picture for some agenda ! LOL !!! Delhi MLA tweets a photoshopped image targetting Delhi CM with foul word. March 10, 2019 Hoax Slayer Comments Off on Delhi MLA tweets a photoshopped image targetting Delhi CM with foul word.